To honor our fallen Brother, former President Gerald R. Ford, 33rd Degree Master Mason, fellow Brethren from the Washington DC area gathered at Naval Lodge No. 4 on Sunday, December 31st, 2006 at 10:30 a.m. We walked together about three blocks to the U.S. Capitol where we gathered in front of the Capitol at the statue of Brother and former President James A. Garfield; where a speech and prayer were done. We then made our way through a one hour wait inline, passing through security check points and into the U.S. Capitol Rotunda where Brother Ford was lying in state. One by one we gave our respect, as well as honors to our fallen Brother. During our walk several in the crowd took pictures of us, and you could often hear by-passers say to one another, "The are a Secret Society" We were often asked "who are you", and when asked several of the Brethren stopped and explained who we were and why we were there. Northern Virginia Masons were well represented. The Worshipful Masters of Acacia Lodge No. 16 Worshipful Jon Shelton and Henry Lodge No. 57 Worshipful Arleigh Rice were there. 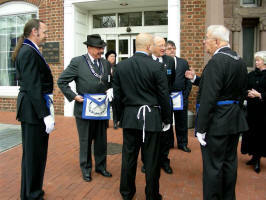 Other Lodges in Virginia were represented, as well as Maryland and Washington DC. and other States. 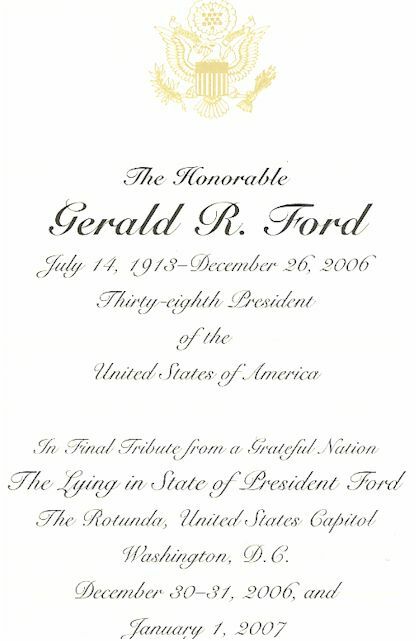 Gerald R. Ford, the thirty-eighth President of the United States of America, was initiated into Masonry on September 30, 1949, in Malta Lodge No. 465, Grand Rapids Michigan, along with his (half) brothers Thomas Gardner Ford 1918-1995, Richard Addison Ford 1924 and James Francis Ford 1927. The Fellowcraft and Master Mason Degrees were conferred by Columbia Lodge No. 3, Washington, D.C., on April 20 and May 18, 1951, as a courtesy to Malta Lodge. The Supreme Council Scottish Rite. Brother Ford was also a Shriner. Brother Ford was the last Presidents to be a Freemason. There have been no know requests by Brother Ford's family for a Masonic Service or Funeral. None are know to have been preformed. Left to right in the picture are: Brother Gerald R. Ford, Worshipful Raymond C. Ellis, Past Grand Master of New York and the President of the GWMNM Assoc, Don Robey, Worshipful Master of Alexandria- Washington Lodge No. 22, (unknown), Most Worshipful Marvin E. Fowler, Past Grand Master of District of Columbia and Executive Secretary-Treasurer for the GWMNM Assoc. The above picture and information was provided by Brother Don Robey. Above is a souvenir, it is a copy of the card they handout to each person that enters the Rotunda. The speech was by Brother Alan Patterson, Senior Warden of Naval Lodge No. 4. Washington, DC. The prayer was by Brother Robert W. New, Chaplain for Acacia Lodge No. 16. Clifton, VA. The interview with ABC News was with Most Worshipful Jules S. Tepper, 2003 Past Grand Master of Washington DC. "He built character. He built integrity. He built honesty and put the nation back on an even course"
Seen in this footage are, Worshipful Master of Samuel Gompers-Benjamin of Franklin Lodge No. 45, F.A. 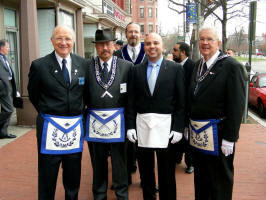 A.M. in Washington DC, Worshipful WB Merriman Parkinson, the one in regalia along with a Brother from Federal Lodge No. 1 in Washington DC. Interview aired on ABC News January 1st 2007 showing us honoring Brother Ford in the Rotunda and the interview with Most Worshipful Jules S. Tepper, 2003 Past Grand Master of Washington DC. This is an edited version where most of the broadcast not related to us has been cutout. The Desert Sun Palm Springs Ca. The 86 pictures start here.....Click on thumbnail of pictures below to see a larger view. The above picture has been edited. Brothers David Johnson and William J, Baumbach II who were taking the pictures have been added, Text describing the event and other pictures have been imposed over the original. To see the 3.8meg 3008 x 2000 high resolution version here. The inside of Naval Lodge No. 4 Washington, DC. I thought it was a very beautiful lodge inside. The picture on the right is of the ceiling. I think the picture on the right is the second best one. The picture on the left. Front left to right, Worshipful Master John Shelton Acacia Lodge No. 16. Brother William J. Baumbach II (Me) Acacia Lodge No. 16 and Brother David Hill, Senior Warden of Acacia Lodge No. 16. I am not in the group picture because I am the one taking them! If you are wondering why we selected this location for the memorial speech, besides a great location for picture taking, the statue is of Brother James A. Garfield President 1881 who was assassinated. The interview with ABC News, is with Most Worshipful Jules S. Tepper, 2003 Past Grand Master of Washington DC. If you want prints or enlargements I can email them to you and you can upload the pictures to a photo lab and then go pick them up, like Costco, CVS, K-Mart, etc. If you want a couple of the original high resolution 3008 x 2000 300 dpi pictures emailed to you please contact me. They are about 2.5 to 3megs each. please provide me the file name of the ones you want. i.e. DSC_1550.jpg. IF you want all of them I will need to mail you a CD or DVD.D. Pictures were taken with a Nikon D70S digital camera at resolution 3008 x 2000 300dpi the lens was a Tamron XR Di II model A14, 18-200mm F/3.5-6.3. The Nikon D70S camera body with Serial # 3075038 that was used to take these World famous pictures of this historic Masonic event was sold on eBay on 01-29-2007 to a woman in Mesa, AZ. I still have the Lens at this time. Pictures, videos and content unless otherwise noted have been provided by Brother William J. Baumbach II William@Baumbach.com 703-791-9522 As long as they are not being used for monetary gain I see no need to copyright my pictures and or videos, so use them as you see fit, just please give credit where applicable. The Grand Secretary of Washington DC. called me on the phone and personally thanked me for sending them copies of the pictures and DVD. The Supreme Council Scottish Rite, it is on the home page. Later published in the Scottish Rite Journal, March-April 2007 issue. 01-11-2013 links removed. Naval Lodge No. 4 Washington DC. Removed link 01-11-2013. These pictures and videos were put on the Acacia Lodge No. 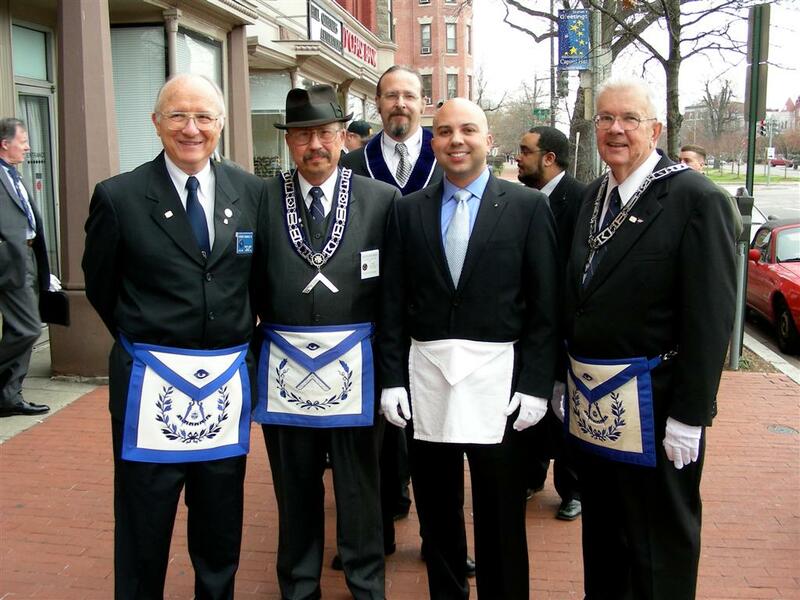 16 website assuming that only a few Masons from Lodges in the Washington DC area were the only ones that might look at them, It seems that the interest in this Masonic event, pictures and videos where grossly under estimated. Within hours of putting the information, pictures and videos online, 12-31-2006 (Sunday Night) by 9am Monday morning the website was so overloaded by visitors that the videos had to be put on three different servers and T-1 lines in an attempt to keep up with the demand, The website has been getting over 1,000 visitors per day, and that number is growing exponentially as word of their availability spreads around the World. It is a safe bet to say that there has been no other Masonic related website in history that has received over 5,000 visitors within the first four days of going online. Word that the Historical Masonic Event had taken place and the availability of the pictures and videos was original sent 12-31-2006 at 9:16pm to the Virginia Masonic Information Net list server run by Brother Jack Canard that only has a little over 550 email addresses on it. By 9am the next day the server was overloaded and the T-1 line was choked-down to a stop with visitors to a point that the webpage would not load, and it was not able to handle its other job of delivering emails for the many business users that depend on the same server. Within hours of that original email being sent it was forwarded to countless thousands across the U.S. and around the World. Word has spread like wildfire, being posted on other websites, Internet News Groups and on Blogs around the World. Here is a good example of that, an email from England was sent to Massachusetts and then forwarded to Canada, Australia, UK and Germany. Comments about the website have even been received from Chile. In April 2007 on the behalf of Acacia Lodge No. 16. I mailed two 11x14 inch wood framed pictures of the Masons in front of the U.S. Capital to First Lady Betty Ford. Below is a copy of the card I received back acknowledging that she had received them. 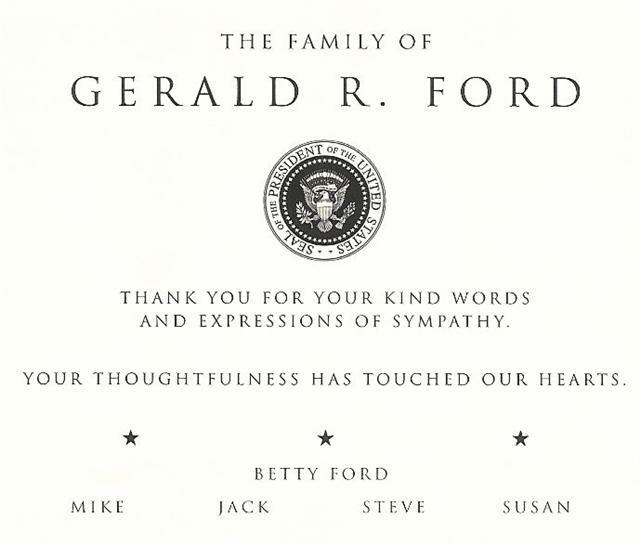 Although a little generic in nature, it is a nice card with a raised Presidential Seal on it.